Silly question - on the occasional days that Taunton to Bishop's Lydeard shuttle services have been run by GWR, how is the interchange to the West Somerset Railway handled? Does the shuttle use one side of the loop and the Minehead train the other, with passengers crossing the road bridge or barrow crossing, or is there a way for the shuttle to arrive into the Taunton facing bay? Or does the shuttle arrive at leave at the main platform at a time that it's not occupied by a Minehead service? Bishops Lydeard is a 2 platform station as far as passenger trains are concerned. Both platforms have the facilities of bi-directional use, and of allowing a train into an already occupied platform in either direction. So it's just about as flexible as any such layout could be. When I travelled on to the WSR from Taunton and return, via GWR DMU service, the train used what I'll call the Down platform to both arrive and depart. The Down Platform Line was occupied by a locomotive waiting to go across to head a Down train in the Up Platform - which train had just arrived from the Minehead direction. Bishops Lydeard is a 2 platform station as far as passenger trains are concerned. Both platforms have the facilities of bio-directional use, and of allowing a train into an already occupied platform in either direction. So it's just about as flexible as any such layout could be. So if I'm reading you right, a train from Minehead could arrive at what we're calling the up platform ... already occupied at the Taunton end. 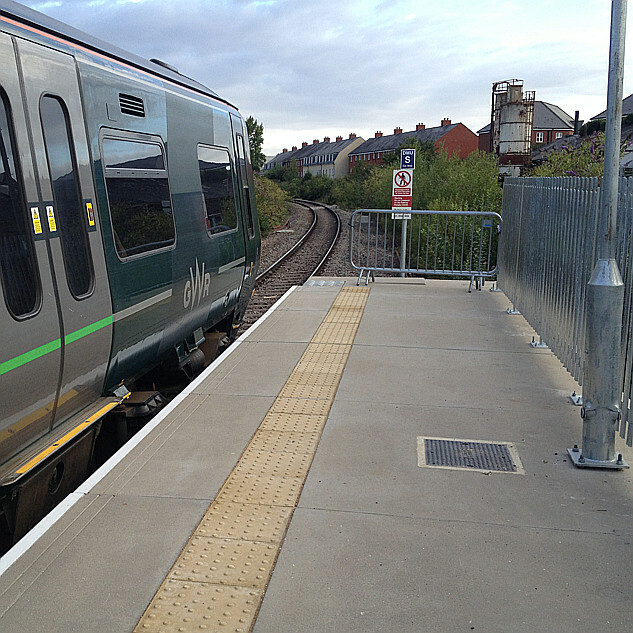 Passengers could then walk up the platform and join the train that's standing there which leaves for (or via) Taunton. Minehead train runs round, loco serviced on the way, and in due course train arrives from (or via) Taunton behind it ... passengers walk down the platform to join their onward service to Minehead. Just for information, the "down" platform is much shorter - I think you could only fit a locomotive and four coaches into it. The "up" platform could hold maybe a locomotive and nine coaches - no doubt someone from the WSR could tell you exactly. The "bay" is never, to my knowledge, used for trains in service - the Quantock Belle ususally lives there in between duties. Don't forget that any idea of (new) platform sharing by loaded passenger services is frowned upon by ORR/RAIB. I find it somewhat concerning that a recent ORR inspection has reportedly found certain deficiencies on the WSR, and that the usual winter shutdown is to be considerably extended to allow rectification of said deficiencies which are reported to relate to track condition and staff training. The infrastructure appears to me to be in good condition, though of course subjective impressions do not tell the whole story. One hopes that the inspection was genuinely independent, and that the report was not politically motivated with the purpose of preventing through running. Or least rendering it unduly expensive. Seeing as the WSR are not actively seeking through running (it's an aspiration of an unincorporated group), then I think suggesting the ORR are pre-emptively nixing outside aspirations is nothing but conspiracy theory. I think that you are PROBABLY right, I just find the timing a little odd, but it is probably just chance. EVENTS have been cancelled and a three-month closure announced after a safety inspection at West Somerset Railway. The Office of Rail and Road, the government body responsible for maintaining and monitoring safety standards, visited the railway and highlighted a 'significant' number of 'improvements' to be made. It has been announced the railway will be closed from January 2 until April 1 next year, and two events will be cancelled, while work is carried out to improve the service. Chairman of West Somerset Railway PLC, Jonathan Jones-Pratt, said work is being done to ensure its 'long-term' future. He said: "We have now received a letter which outlines the steps it requires us to take. "The ORR will be publishing its own public statement about the visit, so it would not be appropriate to pre-empt that. "However, we can say that while we have been allowed to retain our licence to operate we have a significant number of important actions to take. " The chairman said the closure is viewed as 'essential' - but it will mean two events are cancelled and trains won't run during February half-term. He added: "The board has taken the view the railway should close completely from January 2 until April 1 next year. "This will mean the spring gala and the proposed ACE event will now not take place. "There will also be no trains during the spring (February) half terms. "The board consider this short period of closure as essential, both to give infrastructure teams additional time to undertake maintenance but also to allow paid and volunteer staff to focus on qualifications and effective record keeping. "It is also clear that from a commercial point of view we need to refocus our operation and business processes. We have already begun discussions on the way forward." 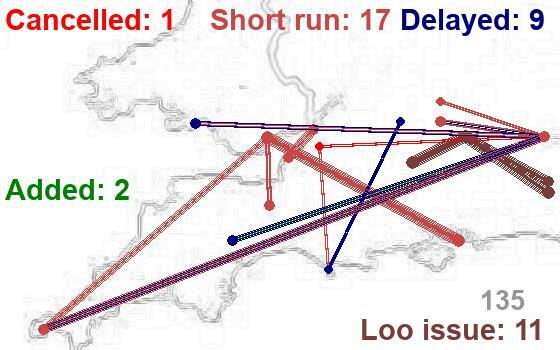 It is currently not clear what aspects of the railway require improvements, but changes are needed in 'several' fields. Mr Jones-Pratt said: "Changes are needed in several fields and the board is committed to undertake this in the most sensitive and constructive way possible. "The directors are determined to ensure the long-term future viability of the railway, and all the actions we will be taking are focussed on that objective." A follow-up visit will take place in March to ensure the changes have been made. Indeed. The Somerset County Gazette is pretty much quoting the press release - so serious, but not yet fully defined nor anything new in this particular article.